Take Your Garage To The Next Level With Customized Garage Cabinets and Choice Floor Coatings. When you require assistance with your garage, you have come to the right provider! 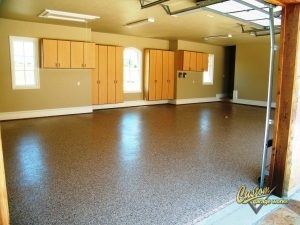 In 2003, we started providing high quality garage floor coating in Anna, TX after we needed more out of our own garages. We set out to create the perfect garage for ourselves and our growing families, but when we could not find what we were looking for within the current industry, we made the decision to jump in ourselves. Presently speaking, we are able to provide our clients with some of the greatest garage storage solutions on the market, as well as floor coatings that are tougher and more durable than traditional epoxy. We are passionate about fantastic garages, and while we began with a simple garage floor coating service, we are proud to provide many additional custom garage solutions to the DFW area. Going up in popularity with each additional year, our garage floor coating in Anna, TX is among the best you can find in DFW. This boom in popularity is likely because our coatings are stronger than epoxy, and cure faster, which means that you can use your garage within 24 hours in most scenarios. Thanks to the tough composition, our polyurea-based floor coating is resistant to changing color and failing that can occur with epoxy. In addition to our floor preparation, which incorporates professional diamond grinding, as opposed to acid etching, the end result is a showroom quality floor that is simple to clean, and practically indestructible. To schedule your free estimate, and to discover more about our garage floor coating services, call us at 214-494-9068 or 817-308-1305! Garage Floor Grinding Our choice of diamond grinding is a more effective method of preparing your garage floor for coating. Epoxy Coatings Epoxy coatings are less reliable than polyurea, and can discolor or yellow in the sun. Polyurea Polyaspartic Coatings Our polyurea polyaspartic garage floor coating options are stronger and more durable than epoxy. And More! If you’d like to discover more about the services we offer, you can check them out here! 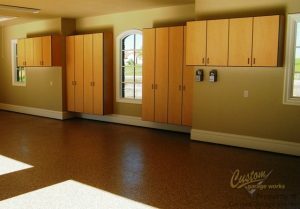 Our Garage Cabinets Look Fantastic When Installed With Our Premium Garage Floor Coating. When you are running out of space in your garage, Custom Garage Works has the right garage storage and organization solution for you! Your garage looks greatest when it is clean and organized. To meet the unique organizational needs of our customers, we offer a variety of different organization products, including overhead storage racks and cabinets. All of our Bulldog cabinets are secured to the wall for added safety, and our overhead storage racks are stronger and more dependable than many others you will find on the market. At Custom Garage Works, we are dedicated to installing the optimal garage floor coating in Anna, TX, and designing the most effective organization solution for our clients, and we look forward to serving you soon! Overhead Storage Racks Do not waste your overhead space! Our overhead storage racks let you get more out of your garage. Storage Cabinets Unlike traditional cabinets, ours are designed specifically to let you get more from your garage storage! Car Lifts If you ever considered making your garage to be a showroom, our garage car lifts are a good place to start. And More! We provide a wide selection of garage organization solutions to our clients, to provide the optimal custom garage! Updated on August 2, 2017 at 4:52 pm by Custom Garage Works. Send us your garage flooring needs today for a completely free estimate.